The alarm clock always seems to ring too early in the morning. Hitting the snooze button is part of my daily routine. 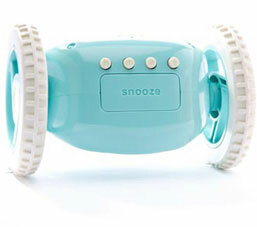 What if your alarm clock didn't give you the option of hitting snooze over and over again? What if it ran away and hid from you? The Nanda Home Clocky Alarm Clock That Runs Away will do just that... it runs away and hides to get you out of bed and ready to start the day! Clocky alarm clock gives you only one chance to get up. But if you snooze, Clocky alarm clock will jump off your nightstand and wheel around your room looking for a place to hide, beeping all the while. 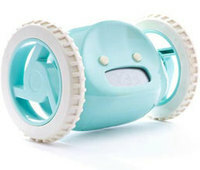 I can see children of all ages having so much fun with Clocky alarm clock. It makes getting up in the morning fun and entertaining! That's enough to make almost anyone want to get out of bed in the morning! My Urban Child is a quality modern home décor store dedicated to providing you with modern childrens bedroom furniture and baby furniture that is safe and sturdy as well as designed to be as amazing as the most inspiring art piece for your child's room. Visit My Urban Child and tell me what other item you would love to have. A special thanks to My Urban Child for this great giveaway opportunity! Did you see their Gorilla Playset? awesome! the gorilla playset looks awesome! The igloo play mod rocker is awesome! I"d like to have the KidKraft Activity Playhouse. also would love to have the KidKraft Backyard Sandbox. I love the DwellStudio Cars Multi Boudoir Pillow. I would also love to have the childrens rug that has pink polkadots on it. I love some of the throw pillows. I am an email subscriber #3.
thank you for the wonderful giveaway! i'd also really love to have an Anatex Mary Engelbreit Tea Time Table & 2 Chairs!